Special two-tone brown version of The Handle camera, manufactured for Coca-Cola as the "Happy Times" camera. It was sold as a premium by Coca-Cola for $17.95 with purchase of a case of Coca-Cola. It is the only Kodak instant camera that does not have the Kodak logo on it. Approximately 25,000 of these were produced. 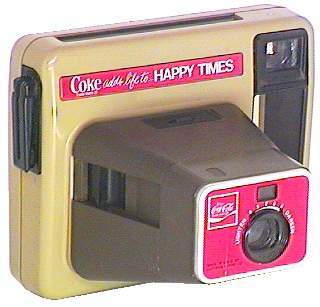 However, the Coca-Cola promotion was not very successful and more than 6,000 of the Happy Times cameras went back to Rochester to be transformed into Kodak Pleasers.